As you or a loved one ages, it may become necessary to make home improvements that focus on maximizing elderly safety and functionality. 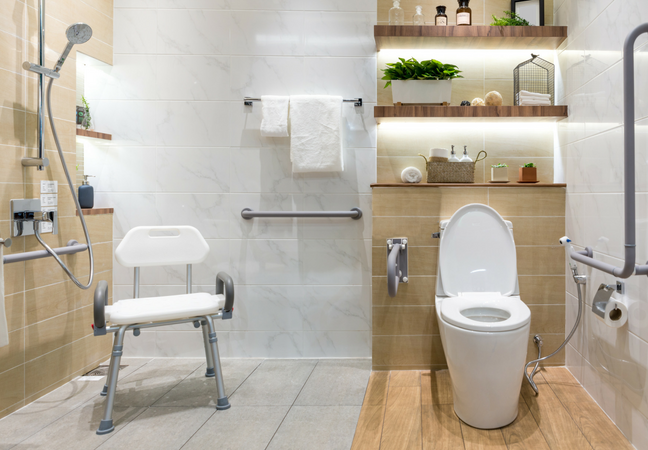 Although the bathroom may be one of the less savory rooms to reflect upon, it has the greatest potential for improvement to minimize accidents. Falls account for more than half of all senior injuries. One out of every three seniors suffers from a fall each year. Approximately 80% of these events occur in the bathroom, making it by far the most dangerous space that your loved one navigates on a daily basis. Annually, almost 240,000 people are admitted to the emergency room due to injuries sustained while using the bathroom, a majority of whom are seniors. Even more alarming is that two out of ten falls sustained by an elderly person results in their death. Don’t take any chances; help you and your loved one live your safest lives. The following tips may prevent unnecessary harm and help maintain independence in old age. 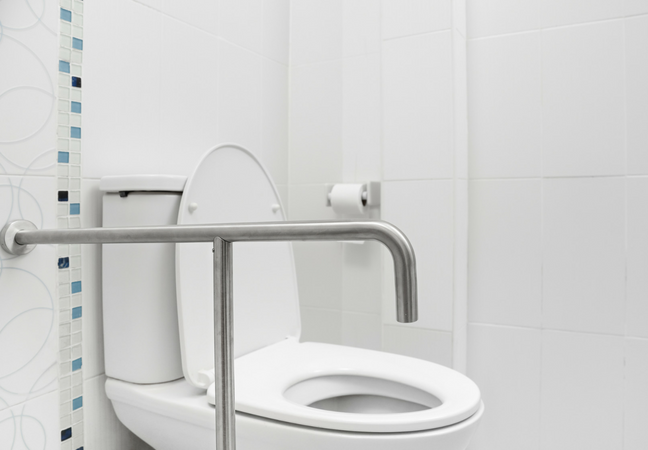 A metal frame or rail with armrests attached to the toilet can help your loved one safely get on and off the seat. The width and height of safety rails are adjustable and the armrests are capable of bearing a person’s weight as they transition from seated to standing. Another option is the drop-arm model that has armrests that can lower and raise and assists those who experience difficulty transferring from their bed, a chair, or a wheelchair onto the toilet. For those who need a raised toilet seat, you can purchase an “All in One” adjustable commode that also features a safety frame and a freestanding bedside commode. This option is particularly good for bed bound seniors or those who are unable to make it to the bathroom in a safe and timely manner. 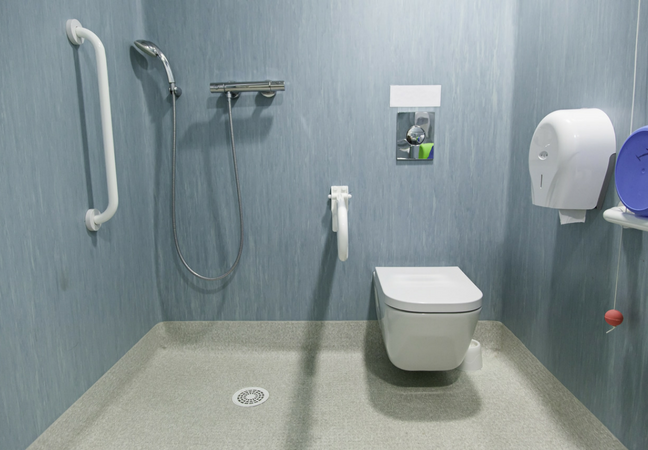 Movement-restricted seniors can also opt for a free-standing or behind the wall toilet with a macerating pump that can be placed anywhere in the house to provide instant and accessible relief. 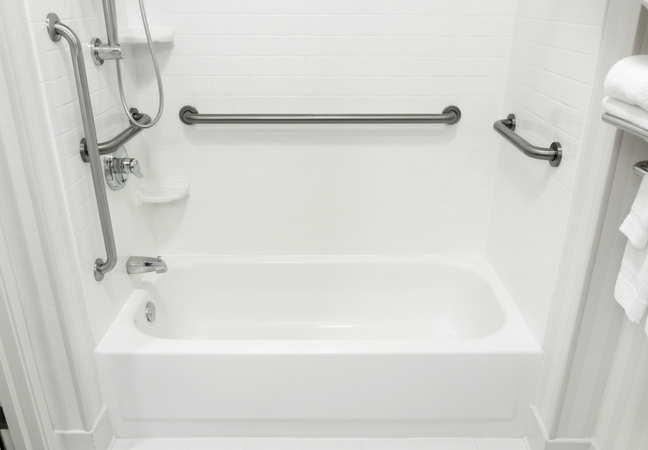 Rather than purchasing a separate frame, grab bars can be permanently installed into the wall or attached via removable clamps. Like toilet safety rails, these bars can provide the leverage and support your loved one needs to stand in the shower, get in or out of the tub/shower, or get on/off the toilet. Look for a grab bar with a textured grip that can support at least 250-300 pounds. Eliminate any structures that cannot support your loved one’s weight or emphasize to your loved one the importance of relying on the grab bars rather than toilet paper holders, towel racks, or wall mounted sinks. Raised toilet seats are common aids for seniors who lack mobility, strength, or flexibility so that they can more easily get on and off the toilet. Raising the height of a toilet seat can be achieved by replacing the toilet itself or purchasing a seat extender. If you choose the latter route, there are many different options including padded seats, “Comfort Height” toilets, those with padded armrests, and those with open access or cut out sections in the front. Consider a seat that has brackets or locking clamps that affix to the rim to provide extra stability. Help your loved one learn to sit safely on the entire toilet seat rather than just the front edge. 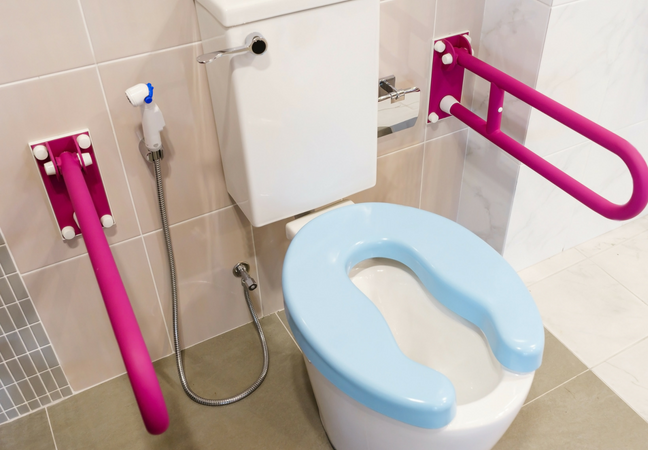 Additional options to make the process even easier for your loved one include choosing a wider toilet seat shape over the round or compact elongated designs and installing a toilet paper holder that can be reached from a seated position and whose rolls can be switched out using a single hand. 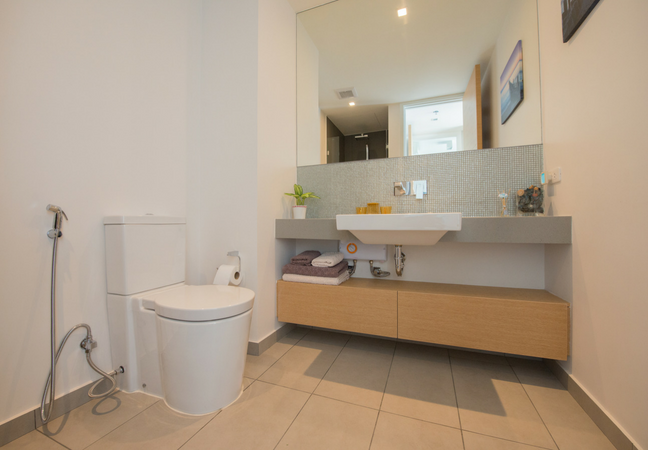 A toilet/bidet combination may also be a good option for improved hygiene and for those who have difficulty cleaning themselves due to flexibility or mobility issues. Reaching for items that are out of reach or slipping and losing one’s balance account for many bathroom falls and injuries. Always store heavy items in the lower cabinets and closet floors. Keep toiletries, shoes, wires, and dirty clothes off the floor, off the rim of the tub, and relatively free from the countertops. It’s easy to trip over a wet towel or a bottle of shampoo. Emphasize the importance of cleanliness to your loved one, and perhaps install extra hooks, shelves, or storage units to keep the ground clear. Sinks, toilets, and tubs with more counter space can also reduce clutter. If the space allows, perhaps place a laundry basket in one corner of the room for dirty clothes and towels. You’ll want to have a mirror that’s at your loved one’s eye level when they’re seated in order to prevent fatigue and accidents. 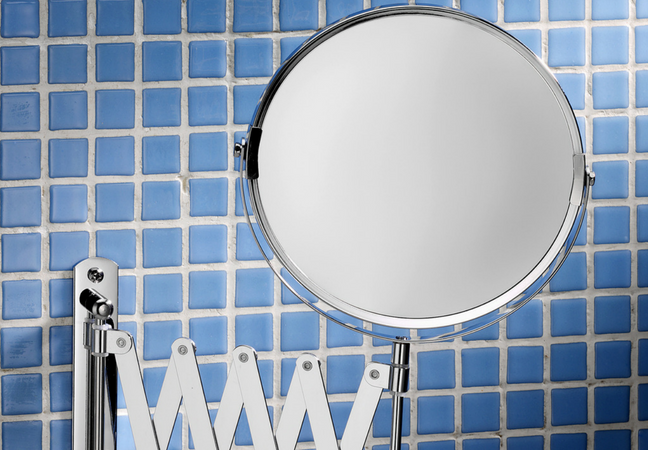 If a low-mounted mirror isn’t feasible, extenders allow mirrors to come out from the wall and lower to the desired level. 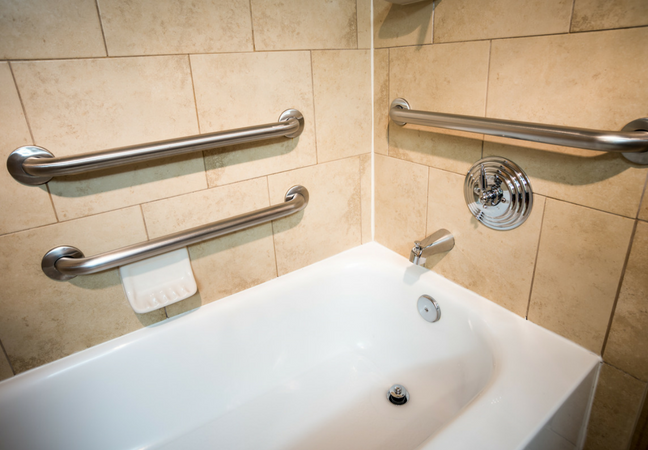 If your loved one has trouble lifting their legs, curbless showers and walk-in tubs can ease their transition from wheelchair to bathing seat. 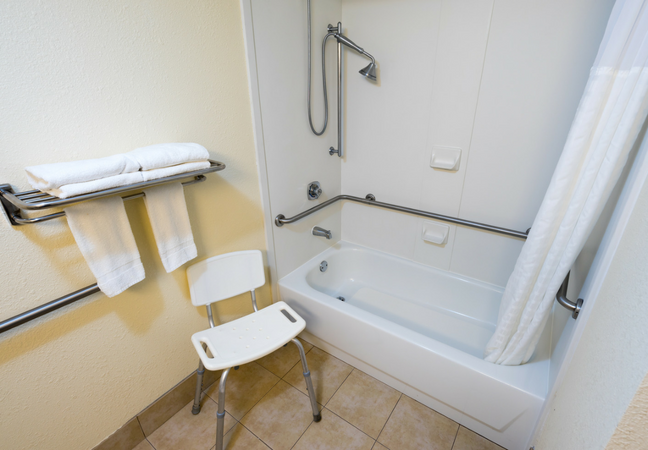 Curbless showers have no-threshold openings that are at least 36-inches wide so that someone in a wheelchair can easily enter and maneuver around the space. Walk-in tubs are taller than normal tubs with side doors and an inner chair-height seat. If affordable, jets can massage the legs and back to provide extra relief. 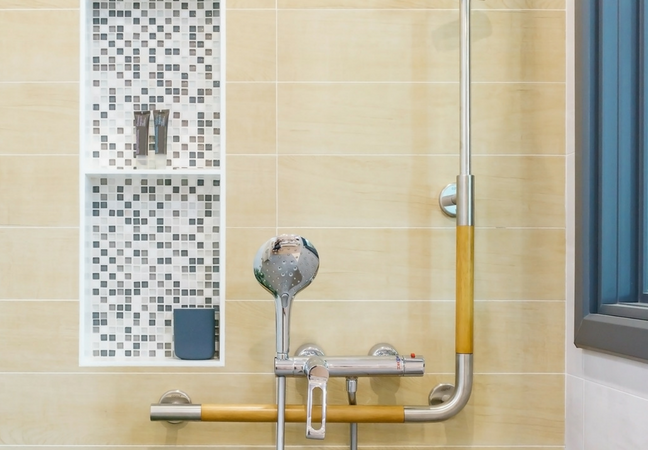 There are many different options for showers and tubs, and you can choose between installing a prefabricated unit or doing it yourself. If you have the funds, consider purchasing a new unit that’s specifically designed for senior care. These removable attachments allow users to control the water flow and rinse themselves while seated. Sprayer attachments can give your loved one the independence to bathe themselves rather than being forced to rely on others. This attachment can be fixed to your loved one’s existing shower arm or installed with a diverter valve and used in addition to the normal shower head. These types of doors come off their tracks too easily, and it can be difficult for seniors to realign them. Instead, replace doors with a plastic curtain to prevent water leakage. Use a shower curtain rod that screws or bolts into the wall so that if your loved one loses their balance and grabs the curtain, the rod won’t spring lose. A bathtub transfer bench is the best option if your loved one has difficulty getting into or out of the tub. These types of seats extend beyond the edge of the tub, allowing a person to slide along the seat rather than step over the edge of the tub. A transfer bench should be placed so that two of its legs are inside the tub and two of its legs are outside the tub with the back facing the faucet of the tub. Like shower chairs, transfer benches should be made of sturdy blow molded plastic or padded vinyl, depending on preference. There are many different options when it comes to benches and chairs, so you should consult with your loved one about their needs and consider your loved one’s physical characteristics and limitations before making a decision. Remove floor rugs that are apt to shift and slip, instead opting for plastic floor mats that provide the grip and stability that your loved one needs. 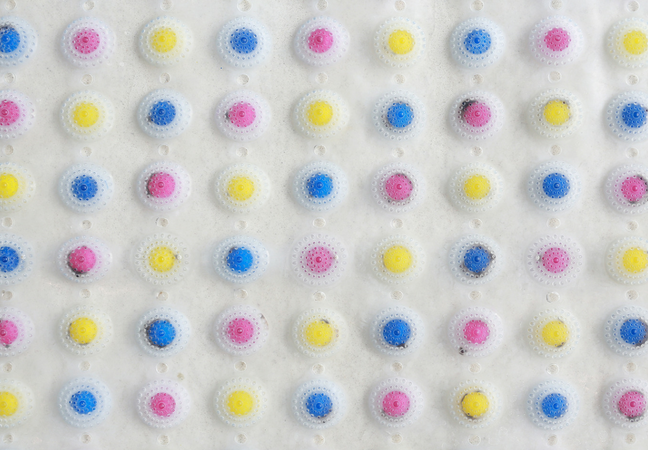 Placemats next to the tub and in front of the sink and place a rubber suction-grip bath mat on the floor of the tub. If you want to go the cheaper route, you can adhere self-stick strips to the floor of the shower or bathtub. Be sure to regularly clean the mats to prevent soap residue buildup. If you’re doing a full bathroom remodel, choose smaller and more textured tiles, anti-skid tiles, or non-stick flooring to provide better friction. In addition, buy your loved one several pairs of non-slip socks that they can wear instead of slippers or bare feet. These socks will help your loved one navigate the bathroom, especially when the tiles are wet. Direct overhead lighting, often the go-to for bathrooms, casts harsh shadows that can confuse seniors. Instead, opt for multiple light sources that fill the space with warm, shadowless illumination. Avoid glare by placing lights on either side of the mirror and minimizing unshielded lighting and shiny flooring. Install a seperate light in the shower or above the bath. Stay away from dim lighting, instead choosing the highest wattage bulbs. If possible, have multiple clearly labeled light switches, one for middle of the night bathroom visits, and one for full bathroom use. Paint and decorate the bathroom in contrasting colors to make it easier on your loved one’s eyes. Plug in a reliable nightlight by the door or the sink that automatically turns on in the dark. Additionally, consider installing motion sensors that can be used to turn on the bathroom lights and the exhaust fan. You can also consider using energy-efficient LED strips to light the floor, sink, toilet, and counters. You could even install these light strips to illuminate the path from your loved one’s bedroom to the bathroom to guide them in the middle of the night. Place a water-resistant, wall-mounted phone in reach of the tub, shower, and toilet in case your loved one falls and needs assistance. 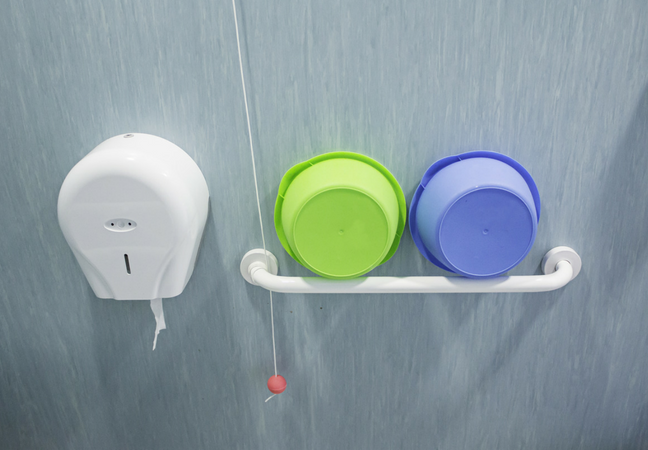 You can also add a flood/leak alarm system to the bathroom that can alert anyone nearby of a problem. Mark with waterproof tape, writing largely and clearly in color-coded markers (red for hot; blue for cold). Test the temperature setting to make sure that the highest temperature won’t scald your loved one. If the temperature is too high, lower the upper range on the water heater. 130-degree water is scalding, so the heater should be turned to a maximum of 120 degrees or anti-scald devices should be added to the faucets. Additionally, you may want to consider installing the easier-to-use level faucets (or maybe a hands-free/foot-operated faucet) rather than the usual twist and turn faucets that can be challenging for seniors with arthritis or limited hand strength. If possible, a larger bathroom is always better for seniors. The more room your loved one has to move around and situate themselves, the lower their chances of falling. Seniors who use canes, wheelchairs, walkers, or other forms of assistance require extra space. Broaden the doorway and design it to swing outwards, use a handle instead of a knob, and if locks aren’t removed, install locks that can be opened from the outside. In addition, consider the location of the bathrooms. At least one bathroom should be located on the main level of the house by the bedroom. If the bedroom’s on the second floor and there’s not a bathroom on the ground level, you may want to consider installing a chair lift or an elevator so that your loved one can easily move between levels. 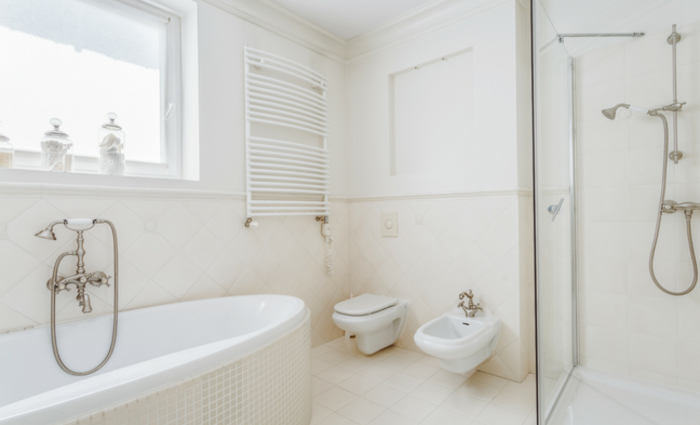 Try to make the full bathroom on the level where your loved one spends the most time, usually the main floor. Obviously, it may not be possible to incorporate all of these safety features into your loved one’s primary bathroom. However, do your best to follow these guidelines and your loved one will be much safer from injury. If you can only focus on couple things, make safety bars and non-slip mats a priority. A future installment will focus on home improvements for elderly bedrooms, so check back soon and sign up for Ayuda’s newsletter to stay up-to-date on all the latest tips!